I saw the first performance of PBO & Friends' short run of Rameau's Le Temple de la Gloire, with libretto by Voltaire, on Friday night, April 28. 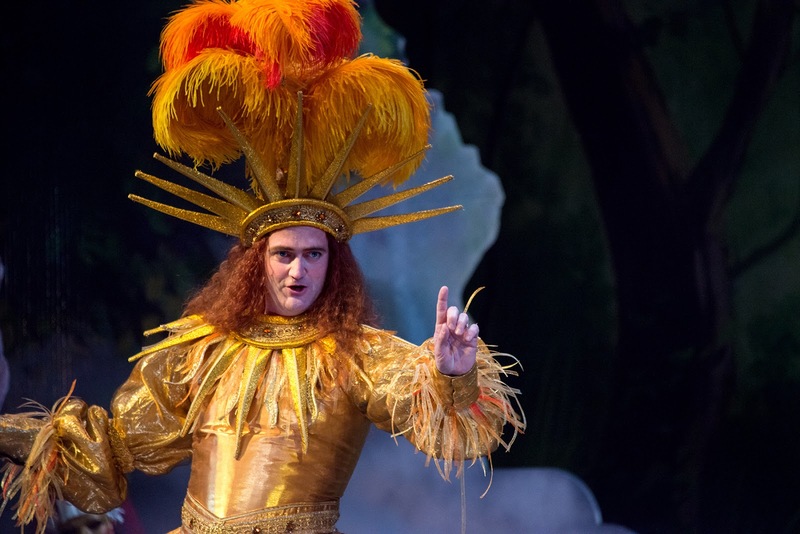 Cal Performances presented it at Zellerbach Hall, one of their venues on the UCB Campus. Oh, man - it was a huge amount of fun. I've seen a fair amount of Baroque opera, most of it Handel with several Monteverdi productions thrown in for good measure. This was my first experience of French Baroque opera; not only that, French Baroque opera presented with an intention of getting somewhere near French Baroque production style. The Handel and Monteverdi operas were all presented in varying degrees of modern style, the better to avoid a completely static production. This was...different, in good ways. 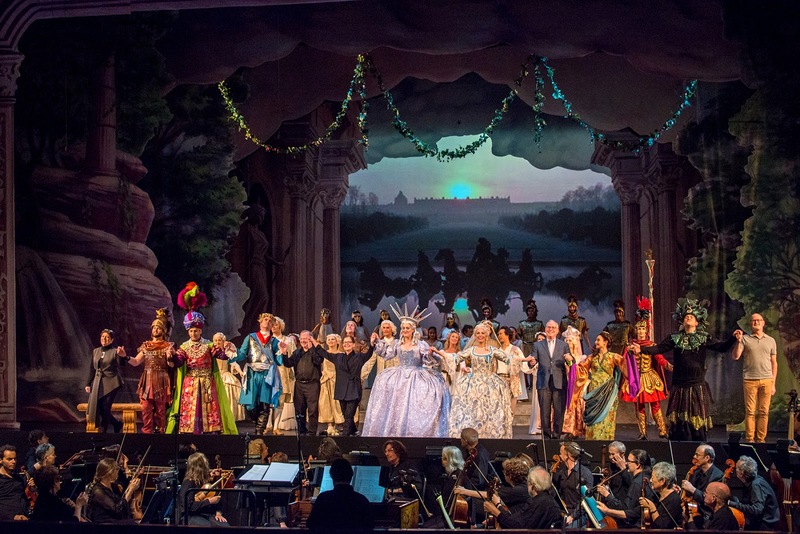 The PBO forces had Baroque-style sets, Baroque-style ballet, and Baroque-style movement. That is, the singers used a vocabulary of fairly stylized physical gestures; the dancers didn't get very far off the ground. The dance vocabulary was more limited than today's ballet and didn't call for the same extreme physical technique. The sets were a hoot; an assortment of painted flats flown in and moved in and out from the sides. Aaron Sheehan as Apollo in PBO’s Le Temple de la Gloire, by Rameau. Photo by Frank Wing. The music was terrific and mostly very beautifully performed; yay, Nicholas McGegan, who brings life and joy to all he conducts. I loved the dancing and the dancers from the NY Baroque Dance Company, and there was a lot more dancing than you'd find in more recent, say, 19th c., operas. The singing was mostly excellent, with some variation of voice size and flexibility. I especially liked soprano Chantal Santon-Jeffery, who has a big, glamorous voice, Philippe-Nicolas Martin, who has a gorgeous baritone voice and would make a fine Chorebe, and Camille Ortiz-Lafont, whose dark and beautiful mezzo lent considerable character to Act 2. 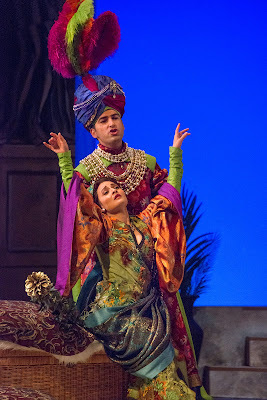 Artavazd Sargsyan as Bacchus and Camille Ortiz-Lafont as Erigone in PBO’s Le Temple de la Gloire, by Rameau. Photo by Frank Wing.